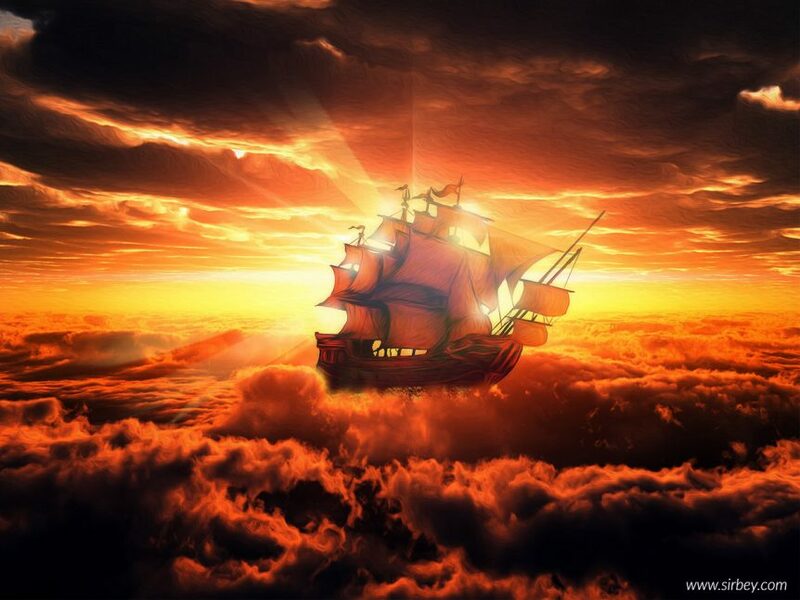 Share the post "The Fabulous ship and the Philosopher"
I see myself in an immense ship, sailing in ever changing landscapes: oceans, valleys, deserts. In the dream, I feel that this fantastic vessel represents humanity itself. The ship is driven by a crew of experienced sailors. I am part of this crew, but I am still a simple apprentice that still has to prove himself. Yet, something troubles the crew: most of the difficulties the ship faces are due to the external elements. 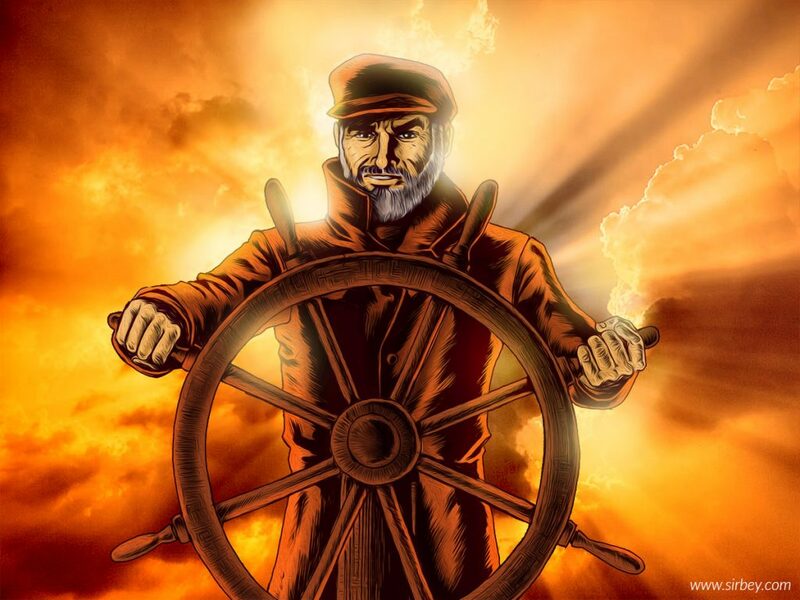 Nevertheless, many of the trials we have to go through come from the Captain himself. He often has a choice between a safe and a more risky road: but instead of security, he systematically choose the most perilous route. Worse, it even happens to precipitate the ship towards danger! Each time we redouble our efforts to save everyone, but this rash behavior ends up creating considerable frustration among the sailors. At the end, they decide to send a delegation to hold the Captain to account. However, I see a fear in the eyes of the crew. I ask why, and they answer me it is because the Captain is no other than God himself! In the next scene of the dream, I see a small group ascending to the upper deck in order to carry collective demands. They finally find themselves in front of the Captain, who appears with the features of Sean Connery. However, when they came to complain, no one found the strength to utter the slightest complaint. The Captain radiates a love and confidence so absolute that the members of the crew lose their means. He asks them why they want to see him. The delegate, who has become incapable of uttering any doubt, barely manages to stammer that everything is going very well with a smug smile. The Captain then winks and congratulates the group, who heads back to the lower deck. Once back, the other sailors ask them how things happened. They soon realize that nobody dared to complain, but the group of delegates is now so enthusiastic that the faith returns and everyone goes back to work without asking questions. I find myself standing next to an old sailor who enjoys the situation and explains that in reality, if the Captain seems to put the ship in danger, it is because he wants each member of the crew develops to fulfill him/herself. The real enemy, he explains, are not the storms, but the mediocrity that threatens humanity. My companions then accompany me on the balustrade and push me outside the ship. I feel particularly anxious about what is waiting for me. 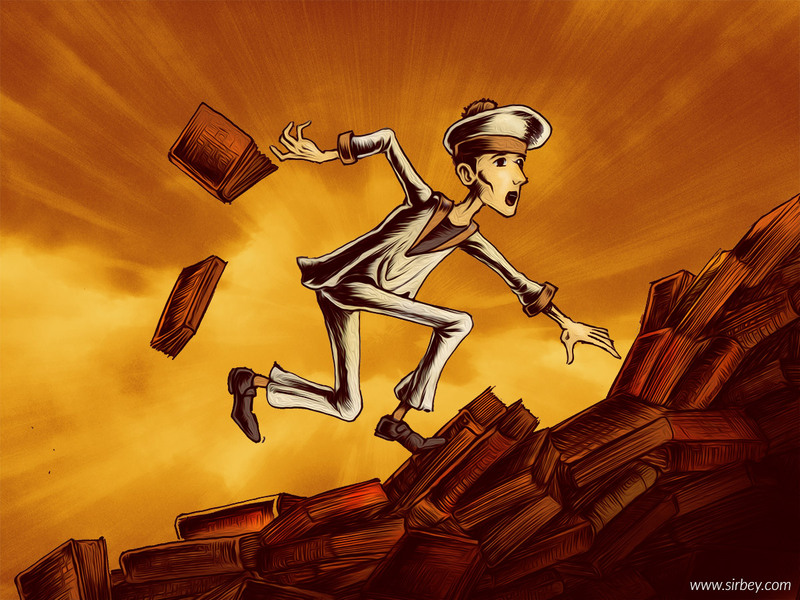 But instead of falling into the water, I land on … a stack of books! They crowd as far as the eye can see. I try to get back to climb the mountain of paper and come back on board, but I cannot progress because the books offer no stable hold. I slip incessantly and I began to move them out of my way, to realize – as they pass before me – that there is a sort of hierarchy in the topics. Thus the first layer is made up of works on languages, followed by those on the sciences of nature, then history, the human sciences, and so on. Looking frantically for a hold, I reject them one after the other, until only one work remains. A book… of philosophy! Yet, although I have abandoned all the others, I feel a terrible sadness at the thought of having to renounce it as well, in spite of the fact that I see that under him there is rock and, therefore, a stable grip. I am suddenly confronted with an essential choice, which I do not want to make. Meanwhile, the ship continues to advance and I see my comrades stretching out my arms to get back on board before it’s too late. I wake up without making any choice. At the time, I had trouble assimilating everything this dream implied. Later, I was able to understand how deep was its message. Philosophy has always considered itself as the highest form of knowledge. Or, more precisely, as the most authentic expression of the human mind. As a philosopher, I have always held this identity for granted. I therefore considered that, if there were to be a conflict, it was between philosophy and disciplines that reduced man to an object. At the time, I spoke fluently the sophisticated language of phenomenology, epistemology and political philosophy and I spent my time classifying each thing into an immense library of thought dominated by the effigies of Aristotle, Kant or Hegel. It gave me this impression of dominating life from a superior standpoint reserved for a few initiates. I firmly believed that through this reading grid, the true meaning of things was revealed to me. However, this dream has made it clear that even the discipline that championed the truth could continue to participate in the evil it claimed to fight. In a remarkably concise way, it showed me that my intellectual mode of knowledge, instead of freeing my consciousness, kept it indefinitely in indetermination. And that the rock, that is to say the real knowledge, was beyond my intellect. At that time, I had already gone through a number of hardships, but I was not truly connected to my inner life. Everything passed through my mind by the membrane of the mind and by the bookish culture. And the more I struggled with these fears, the more I understood that they were an emotional language. I also understood that the only way to answer them was not in the intellect, but in releasing positive emotions like faith, trust and love. It was through the dialogue – often extreme – between these positive and negative emotions that I began to transform myself truly. And the more I learned to listen to my desire and emotions, and more all the intellectual setting that I developed to deal with reality began to fray. I came to use simpler words, but words that had the virtue of being true to what I feel. Since that day, this is the answer that I have endeavored to bring to the final question mark of the dream.